I’d do it will pills. Or jump off a cliff. I’d hang myself from the ceiling by a noose. I’d use an old war sword and slash myself to smithereens. I’d never want to actually die of course. Simply shed myself of skin and distance myself from the wasted years. So might be said of the plights of two unlikely friends and lovers, Harold and Maude. The many years that separate the ages of Harold and Maude are erased by the common ground shared by their seemingly polar opposite spirits. They are as in sync as the sun and the moon. Maude’s spirit shines brightly, allowing her to see the infinite beauty that surrounds her despite the fact that she is a Holocaust survivor and has witnessed the apex of evil. Harold is the moon, surrounded by darkness that is due in no small part to his sheltering, overbearing mother. As he begins to see life through Maude’s eyes, his heart opens wide. The joy of the universe is revealed. 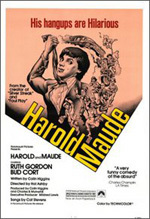 There is profound beauty in knowing that the love between Harold (a young man) and Maude (a senior citizen) never comes across as creepy or wrong, perhaps because it can also be viewed as merely the deepest of friendships. Or maybe we realize that we have the power to let go of our own baggage. Sometimes, we just need to see the world through someone else’s eyes in order to gain perspective and find a way.